Today is the start of our FA Cup campaign. From the moment the draw was made back in July, we have been looking forward to starting our long journey to HA9. For all Non-League sides, the Road to Wembley will ultimately end in disappointment, but there are financial degrees of disappointment. Last season our campaign started on a high in the scorching sunshine at Redhill but ended two weeks later with a feeble capitulation at Hendon. Whilst the Wembley Arch was tantalisingly close for us to see, it would be another 12 months before we could dream the dream again. Every year one or two Non-League clubs go further than their wildest dreams. Our colleagues from East Thurrock United and Met Police have reached the 1st round in recent years, and last season Hastings United traveled to Middlesbrough in the third round with the hopes of all grassroots teams with them. Every year we hope it will be our team. That is the beauty of these rounds of the FA Cup. No egos, no attitudes, no moving games for TV, no guts, no glory. 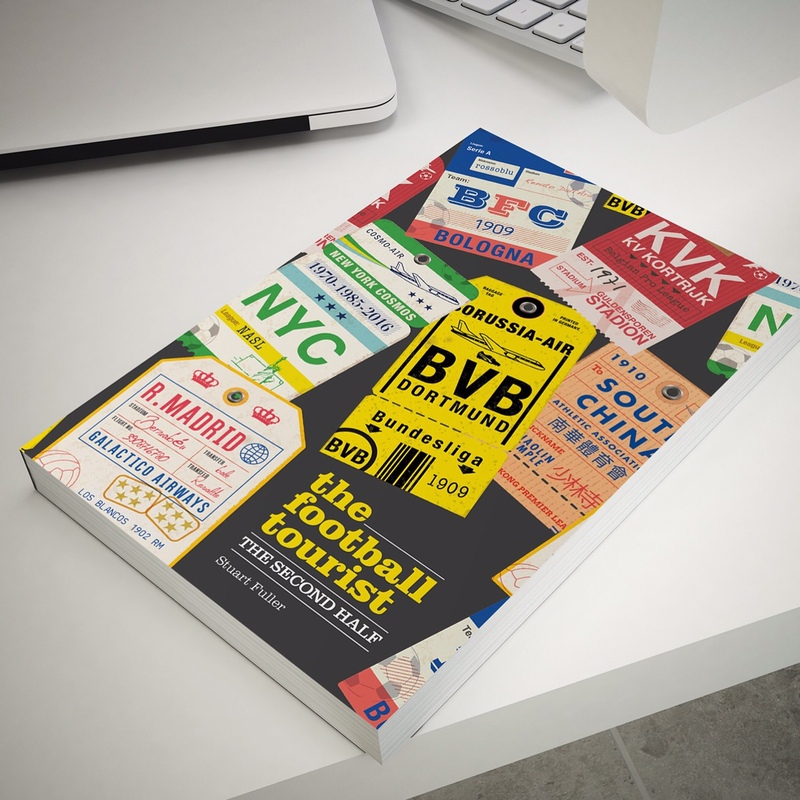 Every team has a story to tell about past glories, unique tales and legendary fans. At 3pm today we will at Piddinghoe Avenue, home of Peacehaven and Telscombe FC, just a few miles down the road and over the South Downs from Lewes. This is what the FA Cup is all about. The conditions, the slope of the pitch and the motivation of the players – that’s what makes the FA Cup qualifying rounds so special. Hundreds will be crammed into the small ground, probably getting soaking wet, watching every kick as eleven of the players will end the tie battered, bruised but one step further to being household names for a weekend. My conversations with colleagues this week have been full of hope and promise. 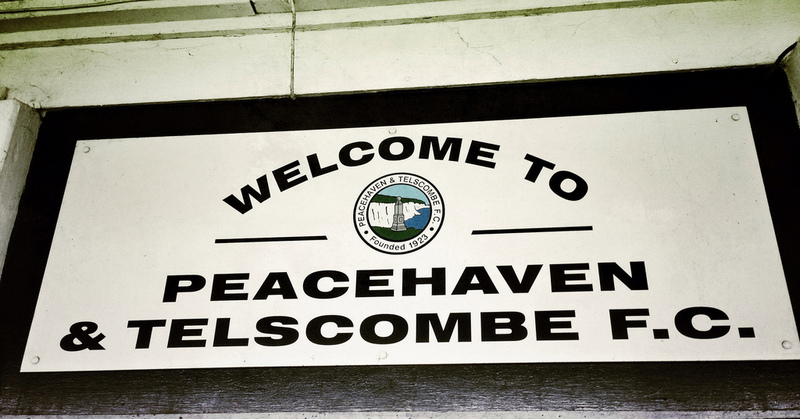 Few knew where Peacehaven was, even fewer that they had a football team. Of course I educated them on how the town was formed back in 1916 and named through a competition in the Daily Express, which was one by a Mrs Ethel Radford from Leicestershire and the fact the town sits on the Greenwich Meridian. “The place where Tiffany’s ashes were scattered in Eastenders? And where Jimmy rides off the cliff at the end of Quadrophenia?” they asked. “Absolutely.” Everyone deep down knows about Peacehaven. 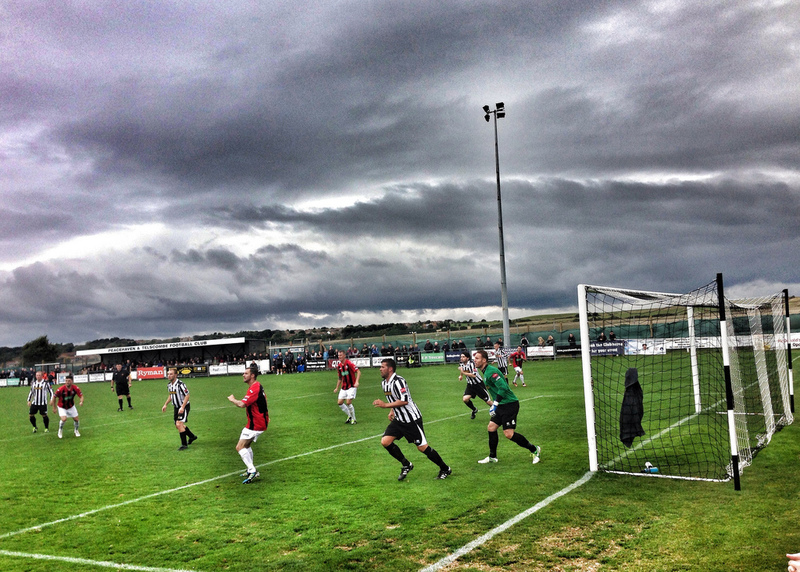 The Magpies are enjoying life in their new home in the Ryman League. After aborted attempts to move up the Non-League ladder in the past, they won the Sussex County League last season and were finally able to take their place in Step 4, rubbing shoulders with the greats of Chipstead, Herne Bay and Walton & Hersham. Mouth-watering stuff. They have certainly scored highly on the entertainment value so far, racking up 20 goals in the league to be the division’s highest scorers although they perhaps don’t want too many repeats of games like the one in midweek against Horsham where they found themselves 4-1 just after the break, only then to concede four goals to be losing 5-4 going into injury time before a late equaliser saved their blushes and an almighty rollocking for the players from manager Shaun Saunders. The excitement around the shops and businesses of Peacehaven was palpable. The club took the decision to start selling tickets in advance online for the game to try and ease entry into Piddinghoe Avenue. With a normal attendance of 146, this would be a great chance for the club to boost their revenues and potentially get one over on their neighbours. 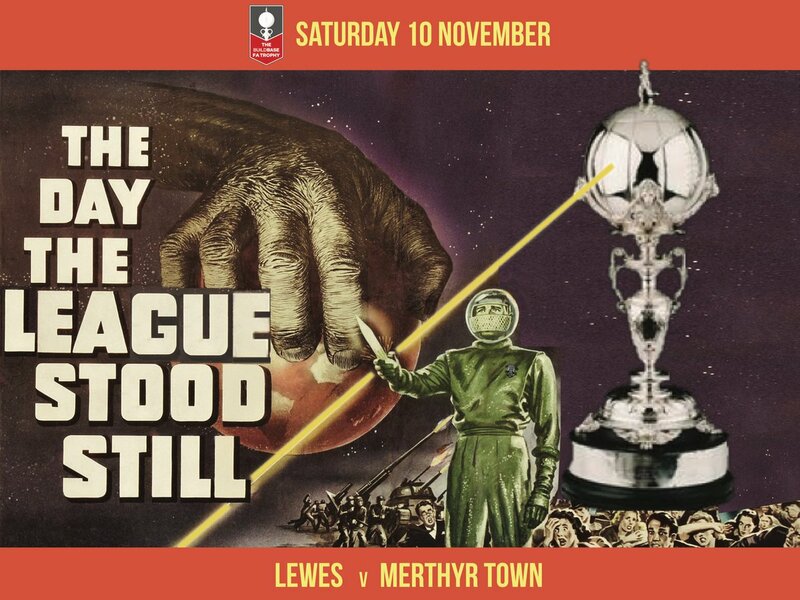 The Lewes Lunatic Fringe were 100% present as we mobbed up in the Magpie’s patch, the Dewdrop Inn before we marched en-masse to the ground, pleased that we had beaten the Sussex Police and their plans for a “bubble” match for the 150 or so Lewes fans. Well, that is how we could write it, or perhaps Deaks, Dave, Danny, Terry, Kev and myself had a nice pint in the pub, a slow wander to the ground where the rest of the Lewes fans were enjoying the fine hospitality laid on by Peacehaven and Telscombe. If the magic of the FA Cup could be bottled and sold on market stalls around the world, it would contain the spirit and essence of this tie. Five goals, last minute drama, an expectant passionate crowd, the infamous sloping pitch and conditions that would test the best in the world. At the final whistle the Lewes players looked to the heavens and thanked their lucky stars that they were still in the cup after a first half battering from the Magpies. However, a half-time bollocking and an inspired substitution turned this game on its head and saw the Rooks into the next round, with £3,000 in their back pocket. The ground was rocking with over 600 crammed into Piddinghoe Avenue, trying to avoid the threatening dark clouds overhead. The skies reflected the gloom of the away fans as the Magpies took the game to Lewes, taking the lead in the 13th minute. It could have been worse twice more they came close to beating Rikki Banks whilst at the other end we looked on remembering Leiston. Don’t mention that word to any Rooks fans – it is akin to mentioning the Scottish play to a thespian. But two substitutions meant that more than a quarter of the players on the pitch were either Crabbs or Jones’s and it was the aforementioned crustation who got Lewes back in the game, setting up Jack Walder who hit an unstoppable shot from 25 yards into the top corner. A goal to grace the finest of pitches, although the rest of the team would later suggest it took a deflection. Thoughts started to turn to the next round and phones were being used to their full extent in checking out the latest football scores on the other non-league FA Cup games at scores.co.uk. With a replay on Tuesday beckoning, Matt Crabb threw another cross into the box looking for the head of Olorunda. The ball bounced up and hit a defender on the arm. Penalty? Absolutely. 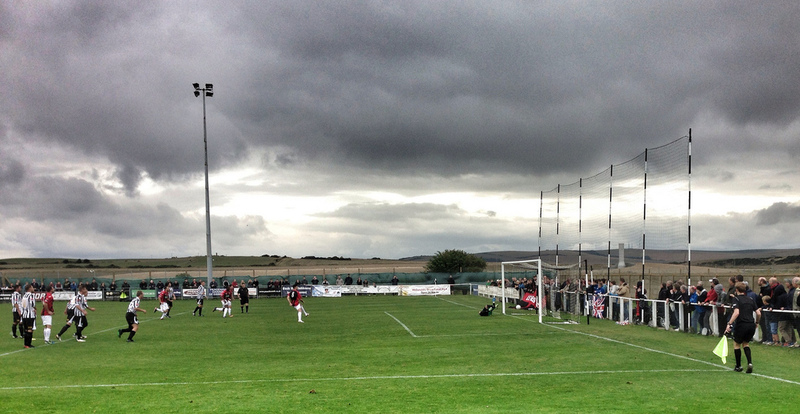 Dixon stepped up, drilled the ball low into the corner and for the first time in the tie, Lewes were in the lead. All of a sudden the time-wasting tactics from Peacehaven disappeared but it was too little too late. 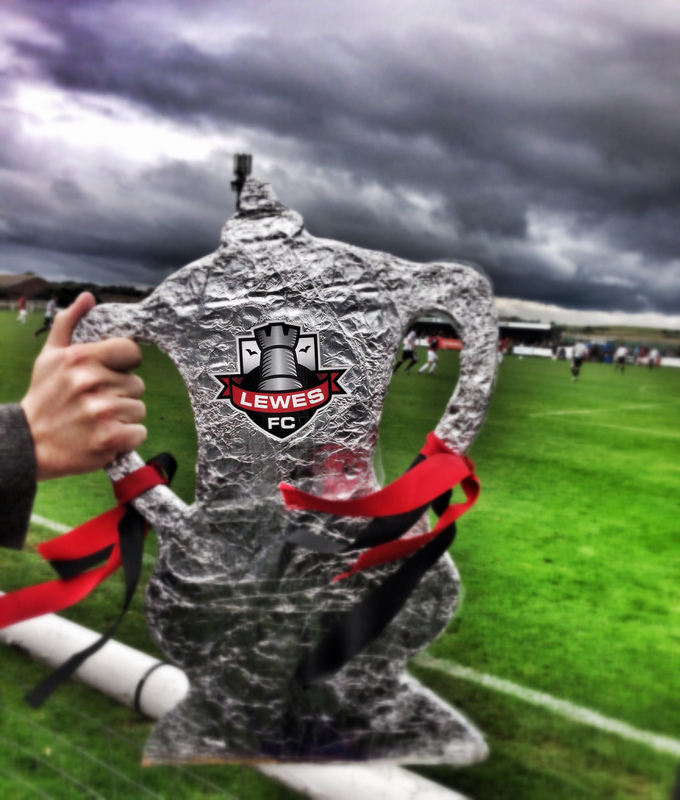 Lewes would be in the virtual hat on Monday at FA HQ for the draw and the £3,000 would be winging its way to The Dripping Pan in used £20’s. This was what the cup was all about. Wouldn’t change it for the world. This entry was posted in FA Cup, Lewes FC, Non league football, Rymans League, Rymans Premier and tagged FA Cup, Lewes, Peacehaven and Telscombe. Bookmark the permalink.